Renault had its barrage of launches in the first year that they entered India and then this year was all about figuring things out for the future. Renault and Nissan have had a great relationship till date and even now they share the same platforms for their cars as well as the production facility in Chennai. After the response that the Renault Duster received from the Indian customers, Nissan moved its gaze to the SUV segment. The Nissan Terrano is the third model in the Renault-Nissan India line-up to receive the badge-engineering treatment. Nissan had the heads up for the other two cars but this time it was the other way around. Unlike the other two badge-engineered models in the Renault-Nissan stable – the Scala and the Pulse – both of which have got mild tweaks to their exteriors to differentiate them from their Nissan equivalents; Nissan has gone a step further with the Terrano and made significant styling changes, including heavy alterations to the sheet metal. These include redesigned bumpers and lights and a new grille, all of which help the Nissan Terrano look like a proper Nissan – the inspirations being the Pathfinder SUV. Book a test drive for Nissan Terrano. Yes. It does resemble the Duster. But Nissan has tried its level best to give the Terrano some stand-out styling cues that clearly differentiate it with the Renault counterpart. While the overall silhouette remains the same, the frontal end is the area where the most changes can be seen. Sporting an all-new face that’s very in-line with Nissan’s family look, the Terrano looks a lot like the Pathfinder or the Patrol from their International product portfolio, which is not at all bad, at least for me. The radiator grille is all new and is a larger iteration of those three piece affairs we’ve been seeing on other Nissan SUVs in the international market. With two prominent lines flowing into the grill, its bonnet looks way muscular than the Duster. The lower end of the front bumpers make for a smarter housing for round fog lamps, while the air dam ends in a bash guard, just like the Duster. The inflated wheel arches from the Duster has been retained but the Terrano’s sharper visage reduces the overtly muscled impression, which I never liked in the Duster. The tweaks on the side profile are less prominent, with curvier door panels and blacked out B and C pillars. Alloy wheels are new as well. And that’s it for the sides. Except the new tail lights, the rear looks similar to the Duster. On the whole, Terrano will grab more eyeballs than the Duster. The updates on the Terrano are all mostly on the interior. The Terrano in this top of the line spec that we have here, comes with a new two-tone leather interior package. The brown and black combination actually does make the compact SUV look a lot more premium that it was earlier (with the beige leather). The soft touch dashboard too gets the same two-tone treatment with a black upper half and a brown lower half. One of the biggest drawbacks of the Terrano was the fact that it did not have an up-to-date infotainment setup. Now though, the Terrano gets a 7-inch touchscreen with inbuilt navigation, iPod support and Bluetooth. Strangely, Apple CarPlay or Android Auto have both been given the miss. You do get a high mounted USB port, which does come in handy if you have your phone mounted on a suction mount on the windscreen. The Terrano also now gets cruise control and a much needed driver seat fold down hand rest which is a boon especially if you have the AMT version like we had. The Terrano still retains all the positives about the interior. The spacious cabin with comfortable seats and the airy greenhouse complement the new interior colors better than the beige did and the large boot is still big enough to dump large bags or a whole bunch of camera equipment in. 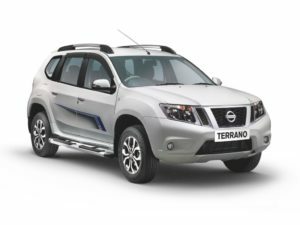 Mechanically, the Terrano remains unchanged. You get two engine options – a 1.6 litre four-cylinder petrol motor and a 1.5 litre diesel that is available in two stages of tune. The petrol engine makes 102 bhp and 145 Nm of peak torque and is mated to a 5-speed manual gearbox. The diesel engine on the other hand is offered with an 84 bhp and 200 Nm avatar or a 108 bhp and 245 Nm of peak torque. The diesel is mated to either a five speed manual for the lower powered SUV or a 6-speed manual for the 108 bhp version. The 108 bhp version also gets a 6-speed AMT gearbox and that is the one you see in the pictures here. And that is not just limited to the engine and gearbox. The chassis setup and the balance between the ride and handling is best in class too. The Terrano has the distinct ability to handle high speed corners faster than you would expect it to do and yet manage to do quick direction changes with ease. And to add, the Terrano has really good ride quality. It can handle almost every single type of road surface thrown at it and yet be comfortable enough inside the car for its passengers. The mileage quotient ranks very highly of the preference list of the Indian population and the Nissan Terrano impresses on this front. The 1.5-liter Diesel engine with 108.5bhp of power output registers a mileage of 19kmpl, while the same engine with 83.8bhp of power output produces an impeccable mileage of 20.5kmpl. The 1.6-liter Petrol engine gives a mileage of 13.2 kmpl and these statistics make Terrano a fuel-efficient SUV. The diesel engine takes 12 seconds to cross the 100 kmph mark and slates a top speed figure of 175kmph. On the other end, the Petrol version attains a top speed of 165 kmph and takes 10 seconds to cross the 100 kmph mark from standstill.Both engines are incredible performers and thus Terrano doesn’t feel sluggish at any given moment. The Nissan Terrano line-up has both Petrol and Diesel engine based versions. The Petrol engine is a 1.6-litre Multi Point Fuel Injection (MPFI) based engine, which is coded as 1.6K4M. It has the ability to displace 1598cc and can yield about 102.6bhp at 5850rpm along with 145Nm of peak torque value at 3750rpm, mated to a 5-speed manual transmission gear box. On the other hand, the diesel variants come with two power options, 85PS (83.8bhp) and the other more powerful 110PS (108.5bhp). This fuel efficient 1461cc, K9K, dCi diesel engine is quite powerful and is delivering an impressive performance. It offers a peak torque of 248Nm at 2250rpm in combination with a maximum power output of 108.5bhp at 3900rpm. The 1.5-litre diesel engine is mated with a six speed manual transmission gear box. Nissan Terrano boasts of a staunch and robust braking system. The front wheels of the compact SUV are incorporated with discs which make braking deft. While the front axle of the SUV has an independent McPherson strut type of mechanism with a coil spring and also a highly advanced anti-roll bar; the rear axle gets a torsion beam axle along with coil springs and a similar anti-roll bar for enhanced comfort for the rear passengers. Both these systems put together ensure that the passengers as well as the SUV are stable at all times. The top-end versions of the Terrano are equipped with the sophisticated Anti-lock Braking System (ABS) along with electronic brake force distribution technology, coupled with brake assist and a stability control module to further upgrade the braking mechanism of the SUV. Other safety features comprise of an engine immobilizer, central locking, driver seat belt reminder, doors-not-well-closed reminder, rear defogger, reverse parking sensor and a heated tailgate glass warning light. Nissan Terrano On-Road Price in Bangalore ranges from 11,88,002 to 17,68,261 for variants Terrano XL P and Terrano XV D PRE 110 PS AMT respectively. Nissan Terrano is available in 5 variants and 6 colours. Below are details of Nissan Terrano variants price in Bangalore. Check for Terrano price in Bangalore at Carzprice. The Indian auto market is in for a treat from Nissan in the form of a fuel-efficient SUV named Terrano that is superior to its French cousin Renault Duster. The Renault-Nissan consortium has an agreement that the donor car will be positioned below the new model and hence the prices of the Terrano are higher as compared to the Duster. The good news for Indians is that the difference between the Terrano and its French cousin is a meagre 40,000 even for the top variant in India for price sensitivity is high in India. This entry was posted in Auto and tagged Nissan. Bookmark the permalink. ← What Are The Risks Complications In Rhinoplasty Surgery? What Are The Risks Complications In Rhinoplasty Surgery?